December 14, 2012. This date will forever remain in the hearts of people across our nation. Months have passed since the tragic events unfolded at Sandy Hook Elementary School, but the scars will never completely heal. The Newtown community will continue to struggle with the remnants of that day while trying to look toward the future. The wide spread debate across the country on the best ways to keep schools safe and prevent additional tragedies like Newtown from occurring again are important. It is also important to create a welcoming school environment that is a safe haven for students, both emotionally and physically. 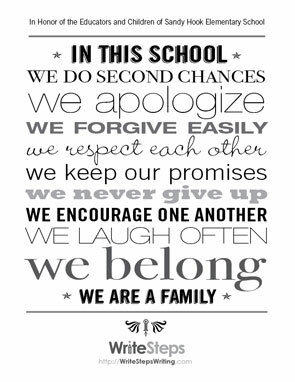 These inspirational We are a Family posters portray an encouraging message for schools and are a tribute to the remarkable teachers and children of Sandy Hook Elementary. We invite you to hang these remembrance posters in your school hallways and classrooms so the Newtown community knows the lives of the children and educators lost will never be forgotten. Download the posters for free by following the link here. The posters are designed to be printed in 11×17 and can be sent to your local printer to print in poster size, or they can be printed in standard 8 ½ x11 formats. Once the posters are displayed in your school, please take a picture of yourself with colleagues in front of the posters and share them on our Facebook page to help spread the message that together, as an education community, we are working to create a better world for our children.